Recently, there has been a lot of talk about oil, conserving fuel, and saving the planet in the news. People are beginning to buy more energy efficient cars, not only because they want to save fossil fuels, but also because it is much less expensive to conserve gasoline. Back during WWII, people conserved gasoline, but for different reasons. Gasoline was necessary for our military to function properly during the War, so in May of 1942, 17 States began rationing gasoline in order to help the war effort. In December of 1942, President Roosevelt ordered that gasoline rationing be set in all 50 states. Gasoline rationing during WWII wasn’t all about gasoline, though. Rubber was perhaps the hottest commodity at the time, and the rationale behind gasoline rationing was to prevent Americans from needing more rubber tires—the less they drove, the less likely they would need new tires! Dr. Seuss Cartoon from 1942. 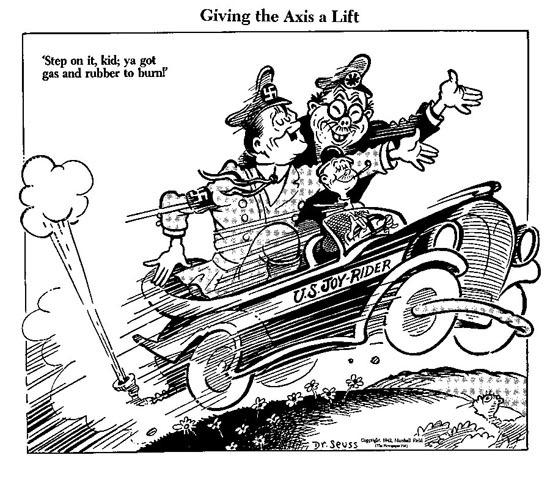 In the cartoon (1942), Theodor Geisel depicts an American man driving carelessly and quickly, with a happy Hitler and Tojo in the back. The cartoon is critical of those who drive like this man. It implies that those who drive quickly have “gas and rubber to burn,” as if they were directly taking away from the American military’s supply and damaging the American war effort. This, in turn, would make the Germans and Japanese happy, as it gives them an advantage over the Americans. Posted by Catherine Perrone, Education Intern and Lauren Handley, Assistant Director of Education for Public Programs at The National WWII Museum.